You can listen to CFXU straight from your iTunes. Find ‘Internet Radio’ and click on the ‘College/University’ drop down menu. 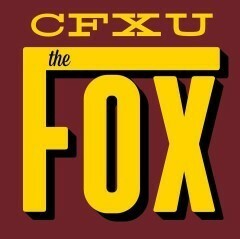 Scroll down and you can find us listed as ‘Radio CFXU ‘The Fox”. Enjoy! Step 3: TuneIn, rock out! Liked the new show “The Daly Dose”. That guy Liam knows his sports and can talk about anything. He has a nice radio voice too. Yes, Liam D. seems well-suited to sit behind a microphone. He knows what he’s talking about, and more importantly, is passionate about his topic. Of course, if you know his family lineage, this should come as no surprise! Yes, his whole family loves music, but Dylan and Laraby are music junkies! But at the end of the day… we’re all just prostitutes and junkies, right? What is the website again to vote for X’s free concert by the Vancouver band ? Hope you play some “Stampeders” and say they have been to your house often. They are coming back to N.S in October i think. They have their own website with their concert dates and locations on it. In light of tonight’s broadcast I believe the Pounding should be renamed “Public Urination” I think it is more appropriate. finally got off my ipod and found this website much more accessible on ze ol laptop (ahah thanks for the shout out kev)- AWESOME late night show folks!!! you guys need to hook more ontario schools up with your pizzazz, spirit, and wonderfully awesome tunes. All students need a late night radio show tooooo – how how! ps. kev klin youre cute. hearing some great tunes sitting here at my desk in Calgary but no way to find out what they are…is there a request line? What a treat.! Grandma and I enjoyed “milk and cookies” around the kitchen table. You are quite the perveyor of stories, congratulations on a job well done. Perhaps make a page every night with a list of songs or as said before me a now playing/ recently played would be awesome! Also i love the melting point! It’s a great variety of music, just suits all of my many tastes. Keep that show going! hey North of 49…Keeping with your hockey theme, Saskatchewan born Joni Mitchell does a song called “Raised on Robbery” which talks about them sitting around, drinking beer and watching and betting on the Leafs games. Must have been a long time ago…lol ! Great show. I agree with Anon, a now playing/recently played list would be sweet. Really like the comraderie/rapport that Sabrina and Veronica have together. It works! Nice touch ladies. Wes Jordan’s first Jazz broadcast was very entertaining. Also enjoyed his commentary on various musicians. Wes has a great radio voice! Just sayin’…..
Nice chill voice with tid bits of information from collected sound and there are some musical gems on it! Enjoying the music from Phil & John this morning. Listening to our man Dylan on his inaugural voyage into radio land. Cudo’s from South Beach Miami….feeling the heat! Yo jordan play some Pretty Lights!!! Heya Pordy!! Im still thinking of a name but can you make a segment of your show- funny/random/interesting internet video of the week!? Cooking and thinking of you. So intrigued by Jessica’s radio show! Fantastic music and great charisma my favourite music to tune into while doing my homework makes it move by that much faster. you’re doing a great job keep up the fantastic work!